It may not feel like it, but our winter is more than half over. We haven’t routinely seen days above freezing since October, and we can expect temperatures to rise into the lower +30’s again sometime in April or May. The greatest change right now is sunlight. We are enjoying eight hours of sun, making our days more than twice as long as they were in December. You can imagine how welcome that is! We thank God for your prayers and your financial support for our mission station. Thank you for your help! 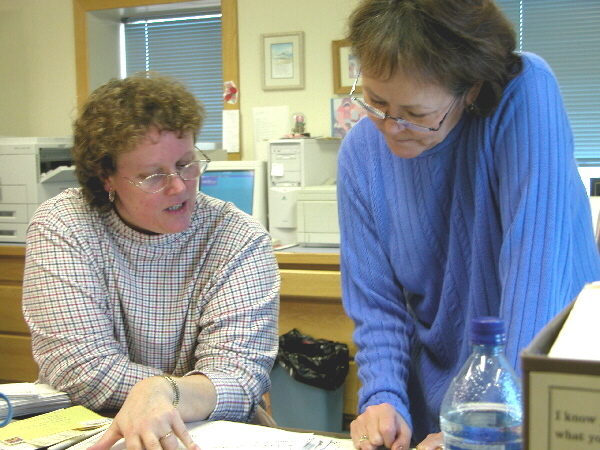 (Left) Meet KNOM development specialist Lynette Schmidt (sitting, with business manager Florence Busch). A volunteer for the station from 1982 to 1985, Lynette joined KNOM as salaried inspiration director in 1996. Today, most of her work is opening and answering mail, depositing contributions and paying bills. Lynette and husband Ric have six children, ages 7 to 15, whom she home schools. At St. Joseph parish, she is a lector, Eucharistic minister and lay presider. You can be sure that she stays busy! SAD TIMES: The third week of January, Tom and Florence Busch were off to the village of St. Marys, 180 miles to the south, for the burial of Florence’s mom Theresa Francis. Florence had spent most of Theresa’s last week with her, in and out of hospitals in the big city of Anchorage. For two days ahead of the funeral, seventeen village men worked long shifts to carve out a grave in the hillside cemetary, using a jackhammer to break up the permafrost. The frozen silt is more difficult to crack than concrete, as it is resilient. Temperatures hovered around +5° F., with stiff north winds. 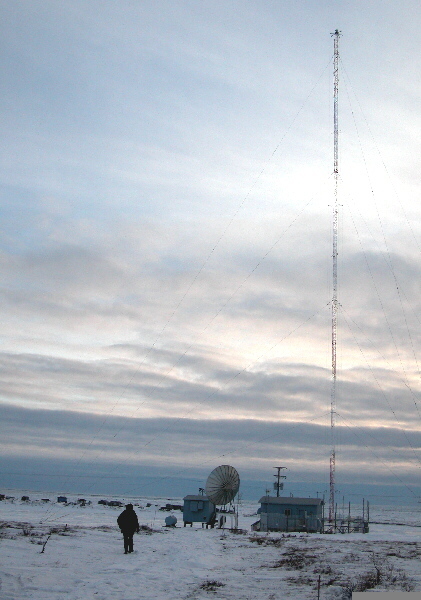 St. Marys is one of thirteen Eskimo and Indian villages set to receive local KNOM transmitters, and Tom reports that the people there are very excited about the project. Please remember missions like KNOM in your will. For many of us, it’s the largest gift we are able to make. We prayerfully place all bequests in funds that will benefit our mission far into the future. INSPIRATIONAL SPOT: God’s Wisdom contradicts the wisdom of the world. With 1,450 residents, the incredibly remote villages of Gambell and Savoonga lie on St. Lawrence Island, about 150 miles southwest of Nome. 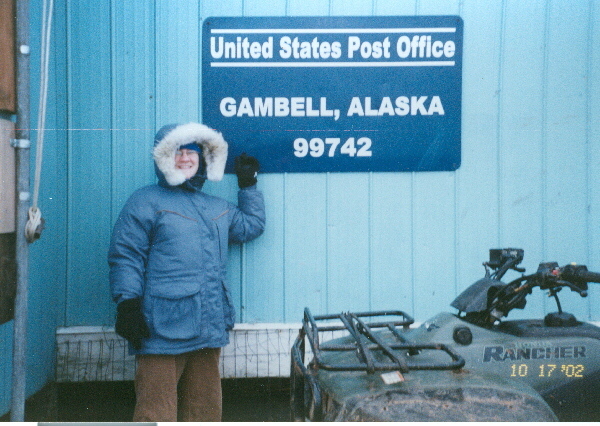 Gambell sits just 36 miles from the mountainous Russian mainland. The communities are populated by Siberian Yupik Eskimos, and are among the most traditional villages in Alaska. Most of their food is harvested from the sea, as it has been for thousands of years, primarily seal, fish, walrus and bowhead and gray whales. It’s prime KNOM listening country. Standing on the beach in Gambell feels like standing on the edge of the world. The 45-mile-per-hour winds and the stark expanse of sea ice are both thrilling and terrifying at the same time. While I have heard that one can see Russia on a very clear day, each time I fight the wind out to the edge of Saint Lawrence Island and strain my eyes, I still do not see the other coast. Gambell’s and Savoonga’s proximity to Russia is precisely why those two are my most frequented locations since coming to work for KNOM. Following World War II, the United States manned outposts on the Northeast Cape of the Island and in the village of Gambell. Incorporating local residents into the Territorial Guard, St. Lawrence Island became the first line of defense between Russia and the United States. When the Army later abandoned the outpost, the memory of the occupation remained in more ways than one. Buildings covered in lead paint and built with materials containing asbestos still dotted the landscape of the Northeast Cape (the tip of the island closest to Nome), accompanied by old satellite radio towers and rusting machinery. Nevertheless, the Cape remained an important cultural center for the people of the Island as a subsistence camp and summer home. In October 2002, an Alaska action group released a report which shocked area residents. Noting increasing rates of cancer, other internal illnesses and birth defects in Island residents, the report pointed to persistent organic pollutants in the soil and water which were contaminating the traditional subsistence foods, such as fish and greens. This is where KNOM's involvement began. I began to travel to the Island for Restoration Advisory Board meetings. These meetings brought together village residents and representatives from the Army Corps of Engineers. Since December 2002, I have sat in on four such meetings. In fact, I’ve been the only reporter to attend them. The meetings are long and complicated with new vocabulary words for me to learn and then explain in stories. I can imagine how difficult things may be for the Islanders. For most of them, Siberian Yupik is their primary tongue, with English a very distant second. Following each meeting, I typically write five or six stories about what changes are being made and the cleanup plans for the future. This summer a subcontractor for the Corps removed all of the buildings from the Cape and barged the debris off the Island. More than 4-hundred connexes, or old railroad cars, were used to hold all the debris from the former outpost. KNOM currently airs about two stories a month on this important issue. Since many of our listening communities face the problem of military contamination, last spring KNOM offered a Sounding Board call-in show on the topic. Before the show began, two callers were waiting on the phone to speak about their concerns. The show went on for 2 hours. St. Lawrence Island remains one of my favorite places to visit. Embedded in my mind are images of elders -- some of their faces tattooed with ancient traditional designs -- and small children, wrapped in fur parkas, waving as they sail by on snowmobiles. The people are always very welcoming and very appreciative of KNOM. In my heart, the Island will always be a place of amazing culture and hope for the future- a clean, decontaminated Northeast Cape where the old ways are practiced once again. (Left) In front of Julia sits a four-wheeler. In the Lower 48, they’re used for recreation. In village Alaska, they are the primary means of summer transportation. Do not worry about what might happen tomorrow. The same loving Father Who takes care of you today will take care of you tomorrow, and every day. Either He will shield you from suffering, or He will give you strength to bear it. Be at peace, then, and put aside all anxious thoughts and imaginings. INSPIRATIONAL SPOT: When we hate our enemies, we give them power over us. Power over our sleep, power over our health, power over our peace of mind. Our enemies would dance for joy if they know how our hatred is killing us, while not hurting them in the least. IT’S A BREEZE: (left) For a daily inspection, general manager Tom Busch hikes the final four hundred feet to our transmitter building, on the tundra three miles east of Nome. During January, 80 MPH winds raked the site bare of loose snow. January 23rd, Tom was out of town for his mother-in-law’s funeral. That day, the winds calmed, but the area was beset by freezing fog, which deposited an inch of hoar frost on the tower and guy wires. As a result, our 25,000 Watt transmitter began cutting back its power. Ric Schmidt stepped into play, rushing out to the site. Walking to the building, he discovered a huge area of frozen blood, obviously an animal kill, a stark reminder that the location is truly in the wilderness. THIRTY YEARS AGO: In February 1974, the KNOM crew geared up to cover the second Iditarod Sled Dog Race. As it had the previous year, Associated Press installed a teletype transmitter in the tiny KNOM newsroom to feed timely information on the race to the rest of Alaska and beyond. SOMETHING VERY FISHY: As you may have read, salmon fishing has been disastrous in Western Alaska for several years. For many Alaska Natives, it has been a terrible loss, as fish represent a major element of their traditional diet. It’s like asking the average American to give up chicken and beef. The news is not all bad, however. In 2002, a regional nonprofit corporation set up a fish processing plant in Nome. They ship in fish from all over the state and sell them at affordable prices, giving local folks a taste of the foods they crave. Thank you once more for your generous help and for your prayers. We just manage to meet our bills month to month, thanks to you. May Our Almighty Father bless you greatly. Thank you! Copyright © 2004 KNOM. All rights reserved.